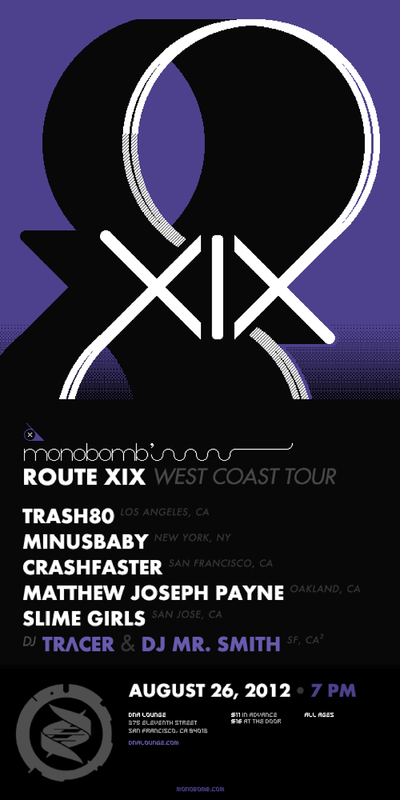 8bitSF and monobomb records are proud to present the Route XIX West Coast Tour, a collection of the finest artists in chip music. Our San Francisco stop is ground zero, with an absolutely massive lineup to keep you dancing and rocking all night long! 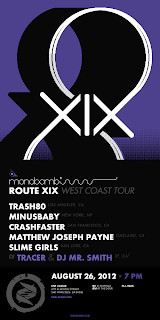 Trash80 captivates and entrances with his blend of soaring dance anthems and flawlessly executed club beats. minusbaby smashes his love for type, patterns and limited palettes into a unique visual and musical language that pushes the boundaries of the art of bass (and how it moves asses). crashfaster combines the gritty chip sounds of the Gameboy and NES with hard-hitting rock and synthetic and human vocals to form a completely original hybrid synth-pop-rock experience. Slime Girls are a distorted pulsewave assault of gameboys, guitars and energetic drums. Sometimes fast, lush and loud punk rock, other times melancholy surf jams, sometimes ever danceable ska, yet always tied together with an electronic wash of melodic chip music. One half of the unstoppable chiptune act The Glowing Stars, Matthew Joseph Payne creates a sound all his own with his chamber-chip-doom-folk solo project.